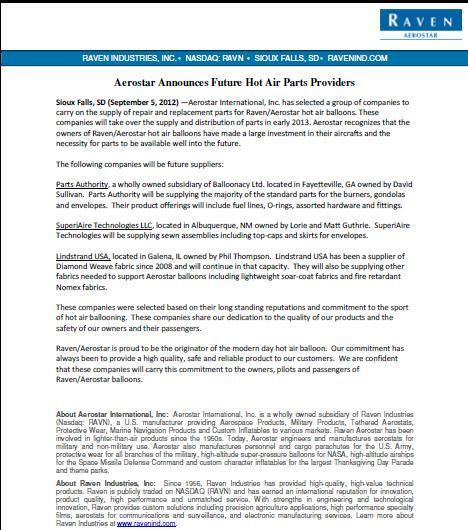 Balloonacy, ltd, LLC, d/b/a Parts Authority, was issued a Parts Manufacturing Authority certificate (PQ4173CE) on January 18, 2013, culminating almost a year of coordination between this company and Raven/Aerostar, of Sioux Falls, SD. The staff appreciates the trust placed in this facility’s operations and capabilities, and we look forward to continuing Aerostar’s tradition of customer service to the fleet of Aerostar balloons worldwide. We ask that our customers and clients understand that we will not have all parts in stock at all times. Additionally, there may be fluctuations in parts prices as we move from “new old stock” transferred from Aerostar to new stock acquired through sources. The 2019 Aerostar Parts Price List is available. When ordering parts, the attached form can be used to organize the information we need, and then faxed or e-mailed to our office. This updated revision of the Operating Instructions Manual for the PX-1 Porosity Tester includes a procedure for the inspection and verification of the calibration plate used with the PX-1. Following this procedure, found in section 4.0, eliminates the need to send the calibration plate to Aerostar International for an annual calibration. If your calibration plate is no longer within the acceptable tolerances, new calibration plates are available from Parts Authority.